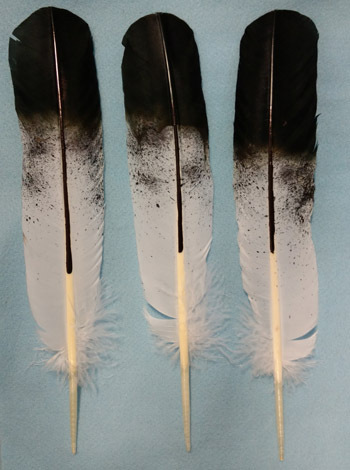 Home > Feathers > Wing Indian Feathers, Wing Feathers, Down Feathers, Fancy Feathers, Saddle Hackle Feathers, Pheasant Feathers These hand painted imitation eagle feathers are high quality artistic reproductions of the immature Golden Eagle Tail Feather. 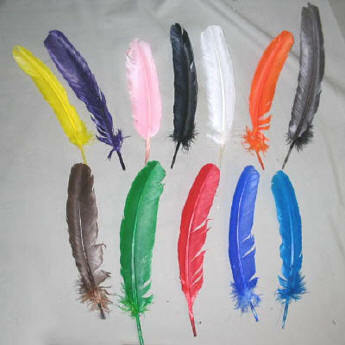 The feathers selected for these hand-painted replicas are the best and biggest the feather market has to offer. They have been pre-trimmed some, but have been left in natural Right and Left curves. For that extra special piece of regalia, whether you're constructing an elaborate Warbonnet or Bustle, nothing looks better and more authentic than one made with hand-painted eagle feathers. Perfect for Feather Fans, Flags, Headdresses, Award feathers or any other project where that 'top of the line' look is desired. IMITATION EAGLE WING FEATHERS Jumbo Quality Selected.